Yes are sharing an update on plans for their 50th anniversary ahead of a North American tour this summer. 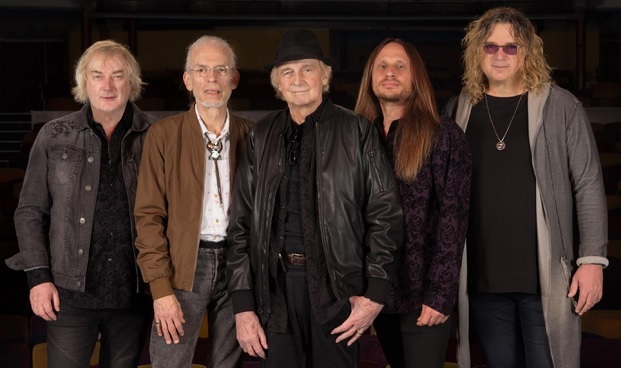 The trek – which will begin with a two-night stand at the Arcada Theatre in St. Charles, IL on June 5 and 6 – will now welcome original member and keyboardist Tony Kaye as a special guest in the lineup alongside guitarist Steve Howe, drummer Alan White, keyboardist Geoff Downes, bassist Billy Sherwood and singer Jon Davison. Artist Roger Dean, who has designed countless album covers and logos for Yes, will be appearing at select dates throughout the tour, showcasing special tour prints at the merch table. Among the prints on sale will be the remaining few of a special limited edition of 1974’s “Relayer”, as well as other classic designs and logos. Yes will release a 5 album/6LP vinyl box set entitled “Yes: The Steven Wilson Remixes”, on June 29. Available on vinyl for the first time, the package will present Wilson's remixes of five of the band's classic studio albums: 1971’s “The Yes Album”, “Fragile” (1971), 1972’s “Close To The Edge”, the double album “Tales From Topographic Oceans” (1973), and “Relayer” (1974). While in town for back-to-back shows at The Fillmore, Yes will appear for a Q&A session at the YesFanFest - 50 True Summers US fan convention at The Foundry in Philadelphia, PA on Saturday, July 21; various Yes alumni, including Patrick Moraz and Tom Brislin, will be performing at the event, as well. Formed in London in 1968 by singer Jon Anderson, bassist Chris Squire, guitarist Peter Banks, keyboardist Tony Kaye, and drummer Bill Bruford, Yes were inducted into the Rock And Roll Hall Of Fame in 2017.